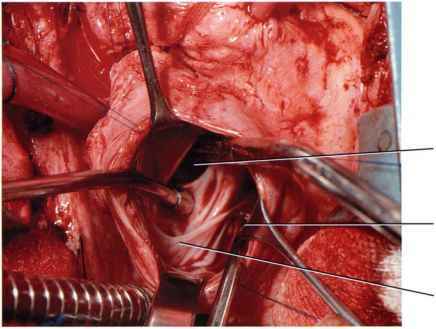 Before cardiopulmonary bypass, extensive dissection is performed. The ascending aorta and main pulmonary artery are freed from surrounding tissue to allow division of the proximal main pulmonary artery. The left pulmonary artery is mobilized, and the right pulmonary artery is dissected to facilitate the superior vena cava-right pulmonary arterial anastomosis. 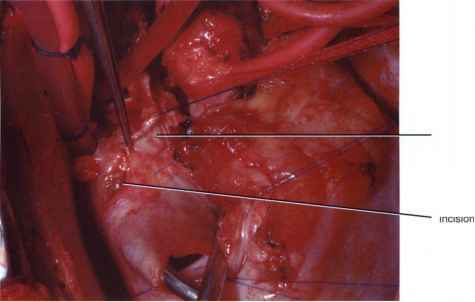 The entire superior vena cava is dissected to near the inominate vein, allowing high caval cannulation and lower caval exposure for the proposed anastomosis. The cava is marked with a suture at the site of division of this vessel, which will allow for an anastomosis without tension or redundancy. The azygos vein is usually sacrificed. The inferior vena cava is cannulated at the inferior cava-atrial junction, saving direct caval cannulation for the stage 2 procedure. 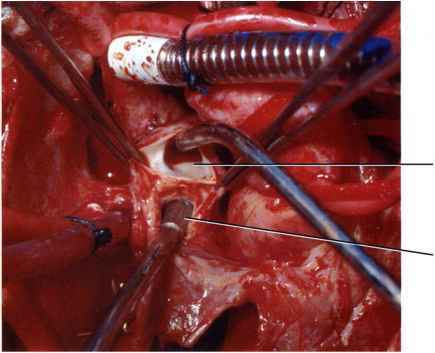 Usually aortic cross-clamping is not used. Air embolization is prevented by use of a large caliber ventricular vent placed across the systemic atrio-ventricular (AV) valve and systemic hypothermia to depress ventricular function. 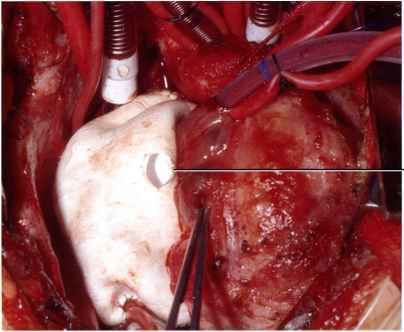 To facilitate the stage 2 operation, the pericardium is closed primarily or a Gore-Tex® pericardial membrane is left in place. Figure 6-1. After cardiopulmonary bypass is established, the main pulmonary artery is divided near the pulmonary valve. The valve leaflets are sutured closed to prevent release into the circulation of any clot that might later form in this blind pouch. 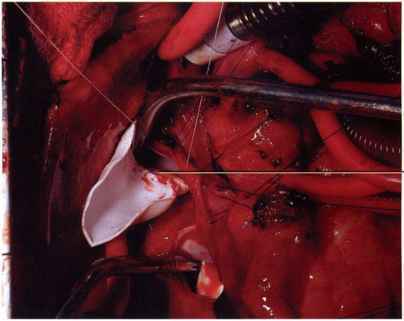 The proximal pulmonary artery is then closed with continuous sutures in two layers. The suture line is supported with three interrupted sutures with Teflon® felt pledgets. 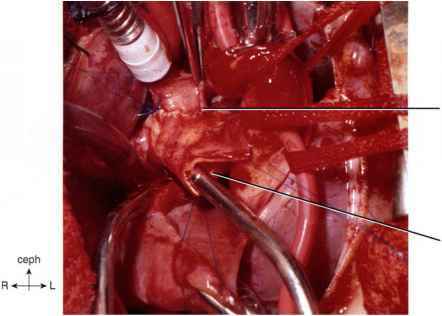 The superior vena cava is divided at a point determined before cardiopulmonary bypass, when the vessel is naturally distended. 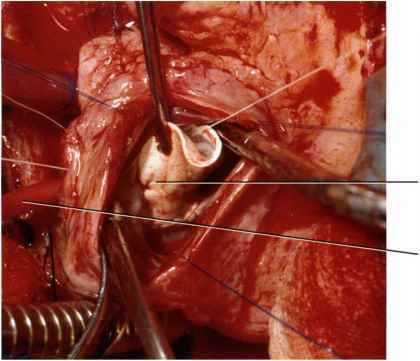 If an atrial septectomy is required, this can be performed working through the retracted proximal superior vena cava orifice. Figure 6-2. 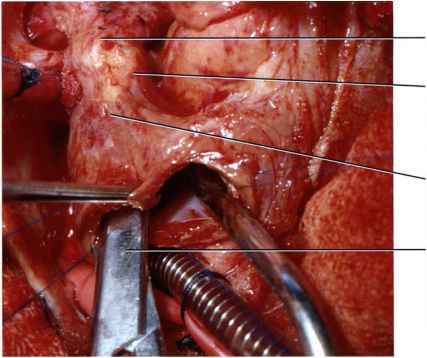 After a right pulmonary arteriotomy of appropriate size along the cephalad surface of this vessel, an end-to-side caval-pulmonary artery anastomosis is constructed with a continuous suture posteriorly. Care is taken to avoid twisting the cava before the anastomosis. Figure 6-3. The anterior row of the anastomosis is completed with a continuous suture only interrupting it with three or four sutures to allow for anastomatic growth. Figure 6-4. The open distal portion of the main pulmonary artery is closed primarily. 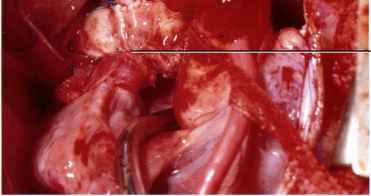 The open lower portion of the superior vena cava is anastomosed circumferentially around the adjacent intact pulmonary artery segment. 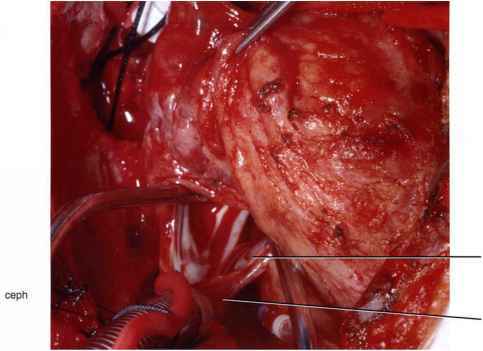 This establishes tissue continuity that will be useful at the time of the second-stage or completion Fontan operation. Figure 6-5. 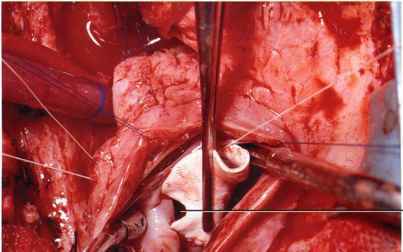 In another patient, the open distal main pulmonary artery is anastomosed end-to-end to the open lower superior caval segment. 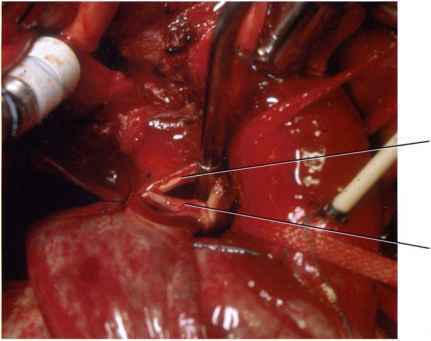 A pericardial patch is inserted in the anastomosis between the two vessels, closing the connection to occlude blood flow. In many patients this helps to maintain patency of the two blind pouches. 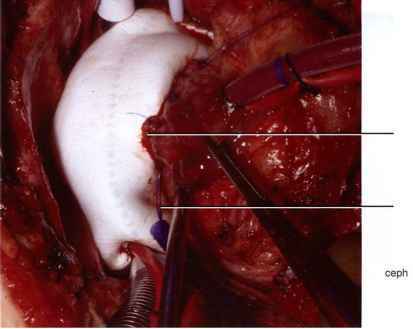 At the later completion Fontan operation, the blind pouches are opened and the pericardial patch is simply excised. Figure 6-6. 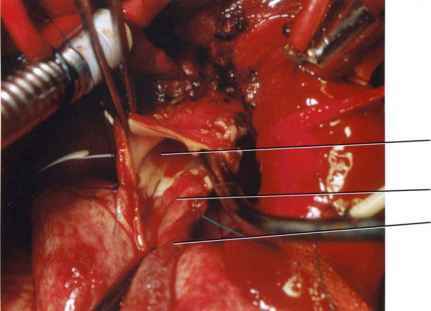 The anterior row of this anastomosis is completed with a continuous suture picking up pulmonary artery wall, pericardial patch, and caval wall with each stitch. Figure 6-7. The anastomosis is complete and the blind caval and main pulmonary artery pouches, respectively, are in continuity. Figure 6-8. 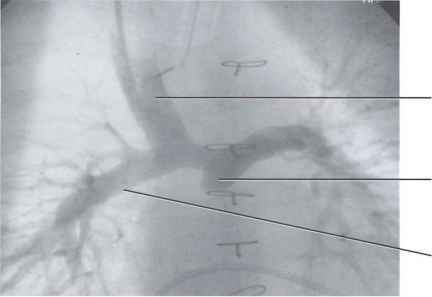 The postoperative angiogram shows a well positioned and functioning bidirectional caval pulmonary shunt. The blind main pulmonary artery pouch is also visualized. 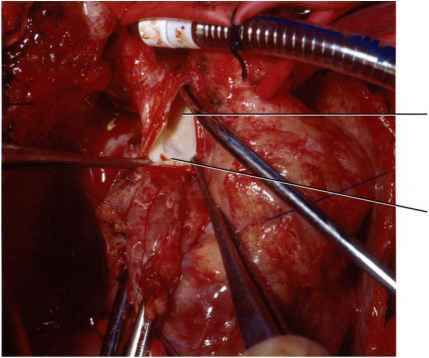 In preparation for this operation, extensive dissection of cardiac structures is performed. The superior and inferior venae cavae are freed for direct cannulation. 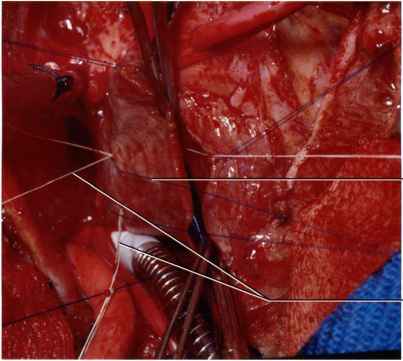 The right pulmonary artery is dissected in anticipation of placing a patch over the previous lower superior cava to blind main pulmonary artery anastomosis. 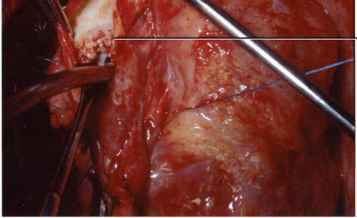 It is also useful to free the proximal left and distal right pulmonary arteries for snaring during the latter patch placement. This allows for hemostasis in the field and facilitates this part of the operation. 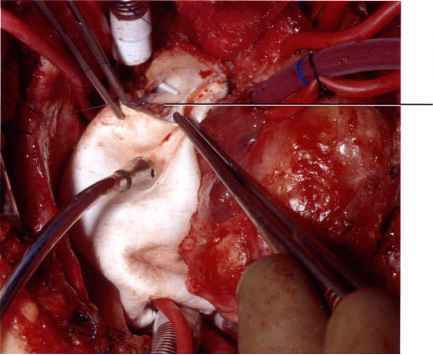 Surgery is performed using cardiopulmonary bypass with moderate hypothermia and left ventricular venting. With hypothermic depression of ventricular function and the use of a large caliber vent to avoid ventricular ejection, aortic cross-clamping is rarely used. Figure 6-9. With the child on bypass, a short anterior right atriotomy is made. 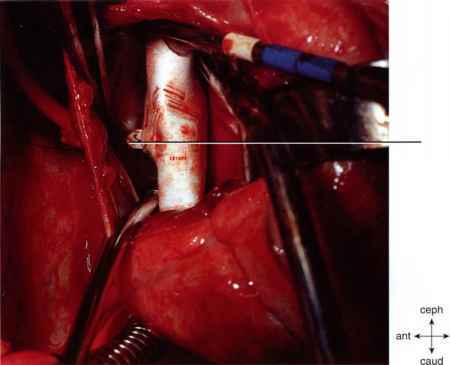 A right-angle clamp is passed into the blind caval pouch and the tip exposes the area posterior to the sinoatrial (SA) node region. Figure 6-10. A longitudinal incision is made laterally in the blind pouch. Figure 6-11. This incision is located posterior to the SA node region. Figure 6-12. 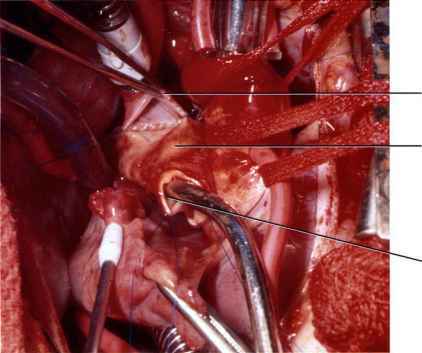 Looking through the atriotomy, an atrial septal defect (ASD) is identified. 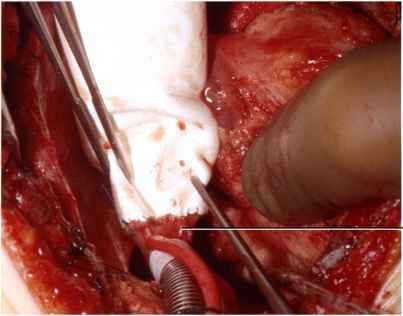 The eustachian valve is prominent and will be used in the repair. Figure 6-13. A rectangular-shaped patch is cut from a large tubular Gore-Tex® graft. Figure 6-14. The lower rim of the patch is stitched to the eustachian valve using a continuous Gore-Tex® suture. The medial margin of the patch is stitched to the atrial septum adjacent to the ASD. Figure 6-15. The right margin of the patch is stitched to the lateral wall of the atrium. A 5- to 6-mm fenestration is cut at the mid portion of the patch. Figure 6-16. A large polypropylene stitch is placed as a mattress suture around the rim of the fenestration and then is exteriorized. Figure 6-17. Gore-Tex® sutures placed at the two corners of the fenestration are exteriorized and tied. Figure 6-19. The fenestration is checked to be sure that it is obliterated by tightening the purse string stitch. Figure 6-18. A tourniquet is placed around the exteriorized purse string stitch and pulled tight. Figure 6-20. A second smaller polypropylene stitch is placed around the original purse string stitch and also exteriorized. By pulling this second suture, the original purse string stitch can be loosened if necessary after closing all cardiotomies. Figure 6-21. The intra-atrial baffle is completed by attaching the upper rim of the patch to the sulcus terminalis. Figure 6-22. The completed intracardiac baffle is in good position and will direct all inferior caval flow to the blind superior caval pouch. Figure 6-23. To establish continuity between the heart and the pulmonary arteries, a longitudinal incision is made laterally in the blind main pulmonary artery pouch that is contiguous with the incision in the superior vena caval pouch. 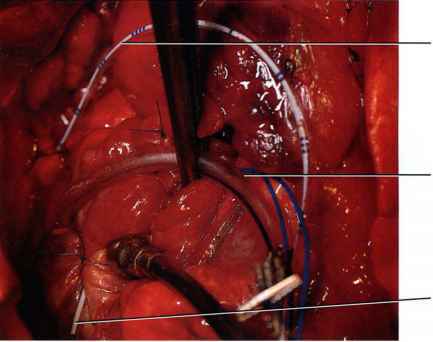 In this patient, the two vessels had previously been approximated by direct anastomosis. 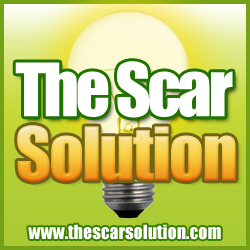 The result is a thick layer of scar tissue that separates the endothelial lining. This lining will be approximated with multiple fine interrupted polypropylene sutures. Figure 6-24. 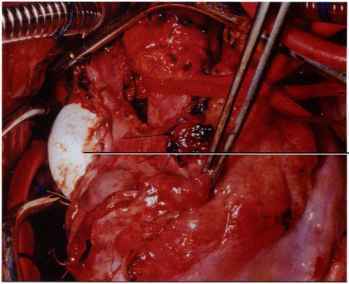 In another patient, the blind main pulmonary artery pouch is opened and the previously placed pericardial patch is seen occluding the opening with the intracardiac structures. Figure 6-25. This patch is excised to establish continuity with the blind superior caval pouch. Figure 6-26. 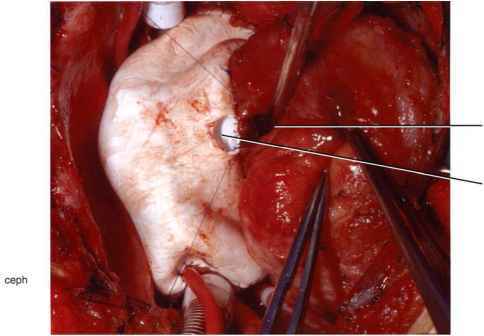 A Gore-Tex® patch is stitched over this area to connect the intra-atrial lateral tunnel to the pulmonary artery. The superior margin of this Gore-Tex® patch extends onto the inferior rim of the right pulmonary artery. This patch is placed on the lateral aspect of the cardiac structures for optimal blood flow dynamics and to avoid placing stitches in the SA node. Figure 6-27. 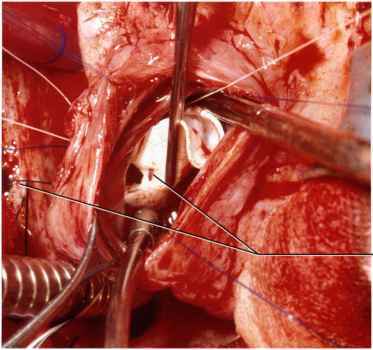 A snare around the exteriorized fenestration suture is positioned along the atrium. If hemodynamics allow, the fenestration stitch can be tied during this surgery but after separation from cardiopulmonary bypass. 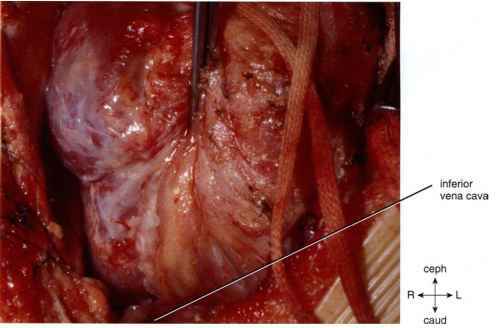 If the fenestration is to be left patent, the tourniquet is stitched to the area behind the right rectus muscle. Some months or years later, cardiac catheterization is performed and the fenestration is test occluded. 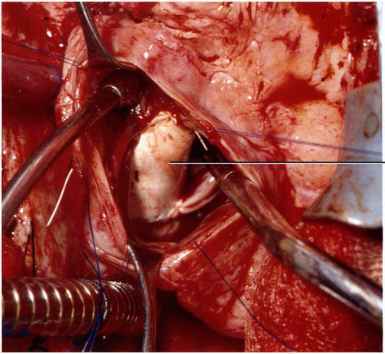 If it can be closed at that procedure, a small incision is made below the xiphoid and the end of the tourniquet exposed. The tourniquet is pulled tight and fixed in order to occlude the fenestration. Figure 6-28. 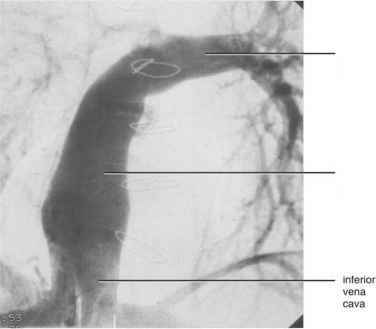 A postoperative angiogram shows the lateral tunnel with flow primarily to the left pulmonary artery. Figure 6-29. 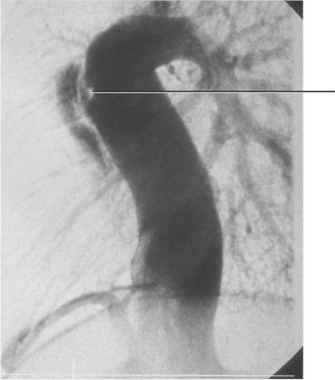 On the lateral view of this angiogram, the patent fenestration is visualized. 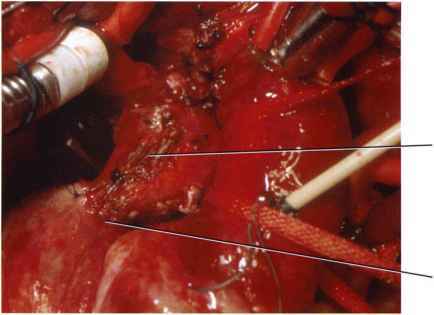 The completion Fontan procedure can be accomplished by placement of an extracardiac conduit. Some surgeons prefer this technique because they can safely perform it, avoiding a significant risk of air embolization without aortic cross-clamping. Utilizing techniques I have already described (moderate systemic hypothermia and the placement of a large caliber systemic ventricular vent), I accomplish the same safety without aortic cross-clamping utilizing an intra-atrial baffle as well as the alternative extracardiac conduit. There is no significant advantage of one technique over the other; although some claim fewer postoperative atrial arrhythmias with the latter technique as a result of avoidance of damage to the SA node. Figure 6-30. 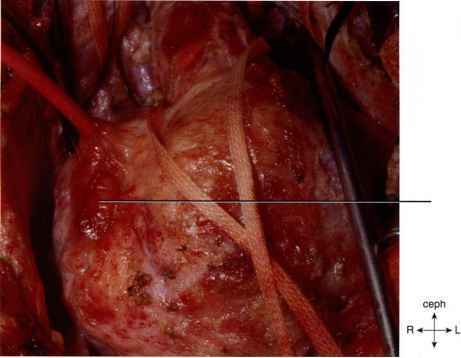 The heart is widely dissected of adhesions and there is ample space between the right atrium and pericardium for placement of the conduit. Figure 6-31. The heart is lifted to expose a long inferior caval segment. Figure 6-32. 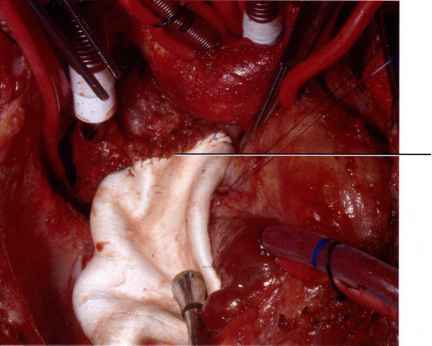 To place the patient on cardiopulmonary bypass, the inferior vena cava is cannulated directly. The cava with an attached rim of right atrial wall is excised. Figure 6-33. The atriotomy is closed primarily. Figure 6-34. A large Gore-Tex® tubular conduit is stitched end-to-end to the inferior vena cava. Figure 6-35. A generous opening is made in the pulmonary artery branches. Figure 6-36. The conduit is stretched to conform with the right heart border to avoid redundancy when the heart is filled after completing the surgery. 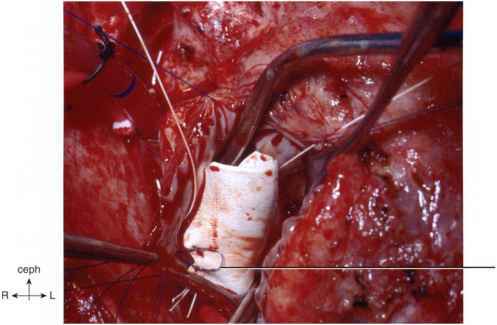 The cephalad end of the graft is stitched to the pulmonary arteries with a continuous suture. Figure 6-37. 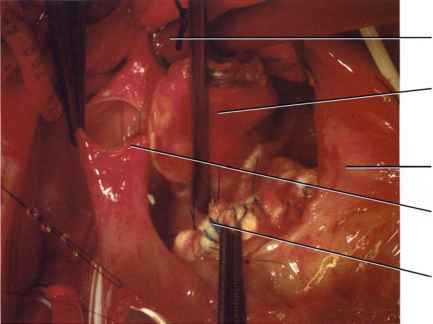 The completed anastomosis with the pulmonary arteries is seen. Figure 6-38. A 5- to 6-mm fenestration is created in the medial aspect of the conduit using an aortic punch. Figure 6-39. The fenestration is adjacent to the mid part of the right atrium. Figure 6-41. A large polypropylene continuous mattress purse string suture is placed posteriorly and will be continued along the anterior margin of the atriotomy. Figure 6-40. 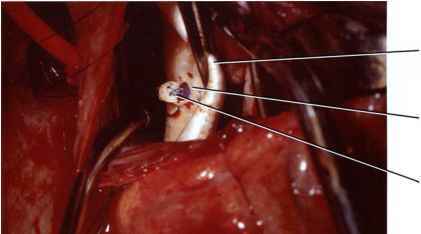 A small atriotomy is made and the conduit fenestration is stitched to this opening with a continuous polypropylene suture. After completing the posterior row of this anastomosis, a fenestration snare stitch will be placed. Figure 6-42. The anterior anastomosis is completed with a continuous suture. The purse string snare suture is exteriorized and a tourniquet placed on same. Figure 6-43. The conduit has been placed and a fenestration created with a flap opening in the lateral aspect of the conduit. 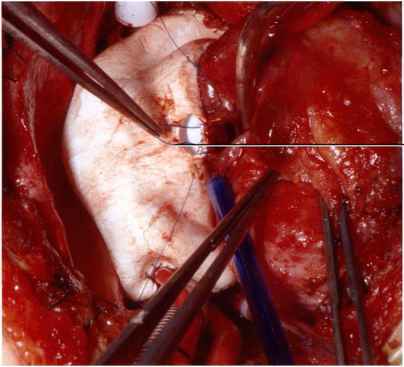 A mattress suture is placed in the rim of the fenestration and through the flap, after which it is exteriorized through the lateral atrial wall. 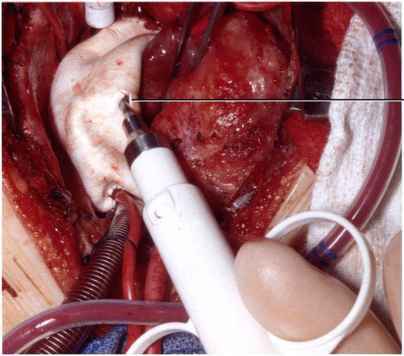 In a few patients with complex and unusual anatomy, neither an intra-atrial lateral tunnel nor an extracardiac conduit repair can be safely accomplished. In these cases, an intra-atrial conduit may be useful. 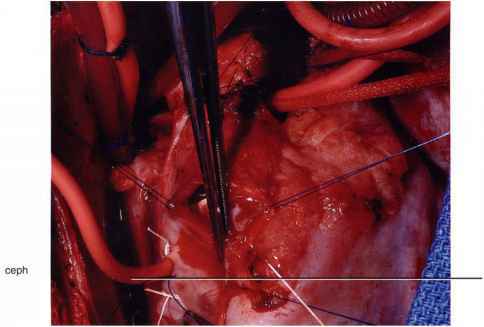 Working within the atrial chambers, a tubular conduit is stitched to the internal orifice of the inferior vena cava. It then passes cephalad to an atriotomy on the superior surface of the atrial chambers, through which it is anastomosed to the pulmonary arteries. Figure 6-44. Test closure of the fenestration is shown by pulling tight a snare around the exteriorized stitch.